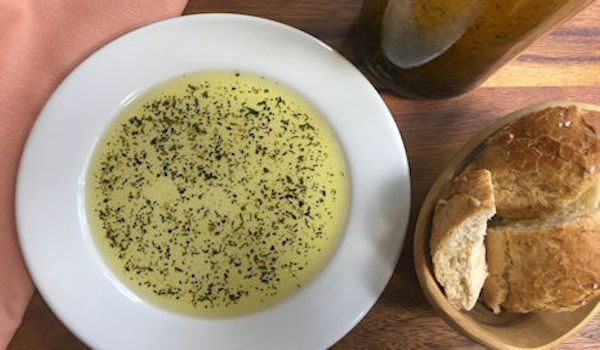 Rustic Italian Bread Dipping Oil is a flavorful start to your evening’s meal. Simply pour spices into olive oil and let the flavors meld. Choose your favorite bread and enjoy a delicious appetizer any time! I like to serve this at the start of a meal or as a snack while watching a movie. Even better, I like to make this Rustic Italian Bread Dipping Oil to give to friends. Add a raffia tie and a note and then you have a wonderful housewarming gift or a treat to take to book club. For us, you might call it a “bookless book club.” Often the food is the best part and our discussion takes a back seat. We find reading to be so overrated when there are snacks like this Rustic Italian Bread Dipping Oil at our book club. One of my favorite times making this Rustic Italian Bread Dipping Oil was at my friend Gina’s lake house. We like to get together for crafting weekends. I brought the supplies for everyone to make their own bottle of dipping oil. It was fun to see everyone adjust the seasonings to personalize the recipe. I left out the crushed red peppers while others added even more. That’s what makes this recipe great because it is easy to alter for every palate. When you give gifts of food, the best part to me is when you eat that food again in your own home. At first bite, you are instantly transported back to the original gathering. I will always associate this dip with our lake house craft gathering. When I eat this Rustic Italian Bread Dipping Oil, I smile and appreciate the friends and good times I shared on our weekend lake retreat. Good foods are the start of memorable events. I hope this recipe will be the start of something special for you, too. Combine dried ingredients and place in a clean dry bottle. Add olive oil and shake to blend. Served with shaved Parmesan cheese and/or balsamic vinegar. Shake before serving. Store in a sealed glass serving jar.